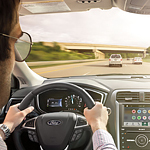 A system for applying the brakes automatically when a pedestrian or other obstacle is detected in front of the vehicle is one key element of Ford Co-Pilot360. The program also includes a warning system that notifies the driver if the vehicle starts straying from its lane of travel. In addition, every vehicle with Ford Co-Pilot360 is equipped with a back-up camera that delivers a clean, crisp image of what’s behind the vehicle so that the driver can avoid potentially dangerous conditions while in reverse.